It is an old axiom, common to both Marxian and Keynesian economics, that uneven, class-based distribution of income is a determining factor of consumption and investment. How much is spent for consumption goods depends on the income of the working class. Workers necessarily spend almost all of their income on consumption, with relatively little left over for savings or investment. Capitalists, on the other hand, spend only a small percentage of their income for personal consumption. The overwhelming proportion of the income of capitalists and their corporations is devoted to investment. It follows that increasing inequality in income and wealth can be expected to create the age-old contradiction of capitalism: on the one hand, sluggish consumer demand narrows the marketability of the goods that capital needs to sell; on the other, profitable investment opportunities depend ultimately on vigorous growth in the effective demand for consumer goods. It is not possible—in the words of the early-twentieth-century U.S. economist J. B. Clark—simply to build more mills that should make more mills for ever in the absence of sufficient consumer demand for the products created by these mills. Nevertheless, a growth in the share of wages and consumption in national income—which might seem to be an answer to this problem—always constitutes something of a barrier for capital because it contradicts its main imperative, as stated by Marx in Capital, vol. 1: Accumulate, accumulate! That is Moses and the prophets! Hence, a rapid increase in demand for consumption goods runs directly counter to the immediate need for capitalists to pay their workers as little as possible. Except for brief moments of full employment or rare periods of effective, militant, working-class struggle, capitalism’s tendency has been to generate a widening gap in both income and wealth between the vested interests and the underlying population, which makes a consumption-based economic expansion, rooted in rising real wages, difficult—if not impossible—to achieve. barely above pre-recession levels. And the gap between poor and rich is huge: the bottom fifth of U.S. households receives less than 4 percent of the national income, while the top fifth takes home almost half of it. ‘The expansion has been very good for capital, but not for workers,’ says Edward N. Wolff, a New York University economics professor. But if this is the case, where is all of the consumption coming from? Has capital managed somehow to square the circle—to increase consumption rapidly while simultaneously holding down wages? The obvious answer—or a good part of it—is that in a period of stagnant wages, working people are increasingly living beyond their means by borrowing in order to make ends meet (or, in some cases, in a desperate attempt to inch up their living standards). To a considerable extent, the current economic expansion has been bought on consumer debt. One indicator of this is the ratio of outstanding consumer debt to consumer disposable income, that is, income after taxes. Table 1 provides data on this ratio. 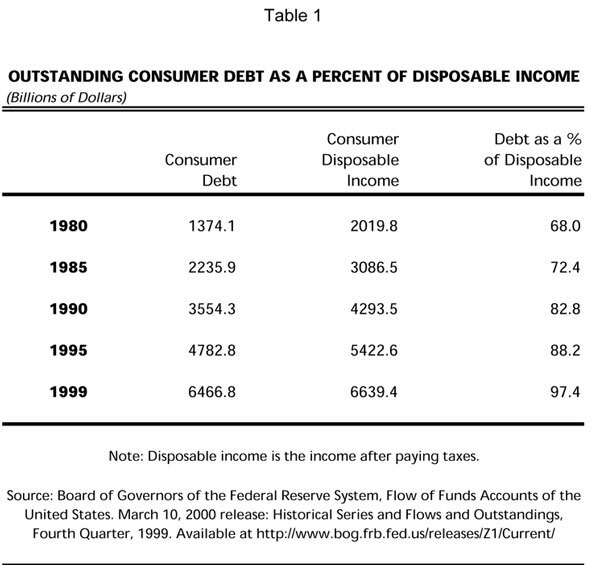 What we see is rapid growth of consumer debt as a percentage of disposable income: from 68 percent in 1980 to 97 percent in 1999. Although the growth of debt as a percent of disposable income is normal during an expansion, record levels are now being reached, creating what Forbes magazine (March 6, 2000) has called an unprecedented burden of debt. Such aggregate data, however, cannot account for the specific problems represented by debt management among various income (class) categories of the population. For that purpose, it is necessary to turn to the Federal Reserve Board’s triennial Survey of Consumer Finances (SCF) for 1998, released in January 2000. Family debt as a percentage of total family assets rose, according to this survey, from 12.4 percent in 1989 to 14.4 in 1998. What is known as the debt burden of families, or the ratio of total family debt service payments to total family income, rose over the same period, from 12.7 percent to 14.5 percent. This is broken down into various income categories in Table 2. 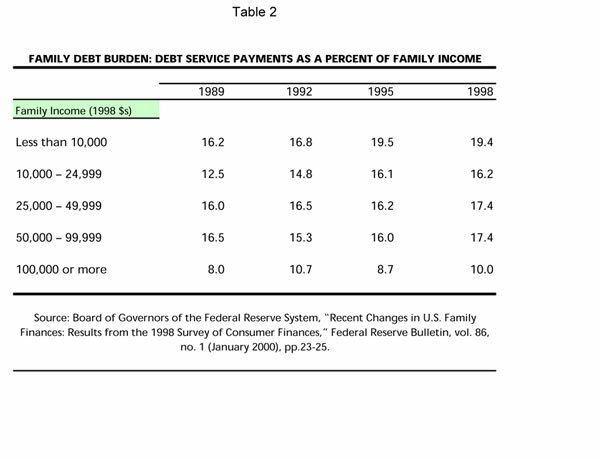 All income groups shown in Table 2 saw their debt burden rise over the course of the 1990s. The debt burden was highest in 1998 for those families earning less than ten thousand dollars a year, as one would expect. The next highest debt burden is often carried by families with incomes between twenty-five thousand and 49,999 dollars. But in 1998, families with earnings in the fifty thousand to 99,999 dollar range were carrying an equal burden. The debt burden drops precipitously at or above an income of one hundred thousand dollars a year. All of this points to the class nature of the growing debt burden of families. This is even more evident when looking at those indebted families who carry heavy debt burdens and those more than sixty days past due in their debt service payments. 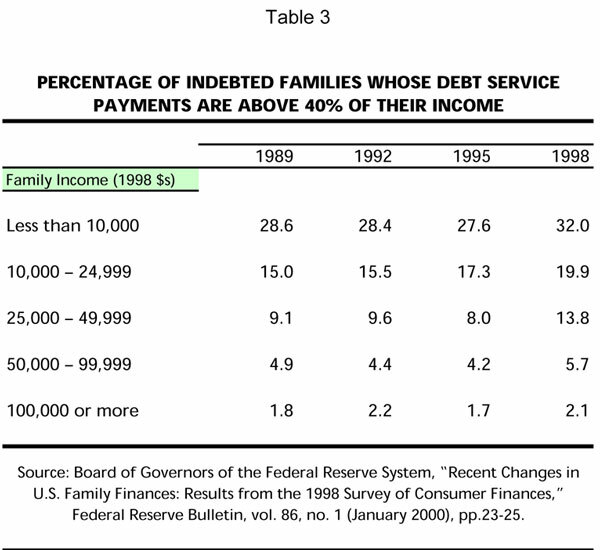 Table 3 shows the percentage of indebted families with ratios of total family debt service payments to total family income above 40 percent. It is clear from this data that financial distress resulting from heavy indebtedness is largely confined to working-class families with incomes below fifty thousand dollars per year, and that it is a very serious threat to families with incomes of less than ten thousand dollars per year (who, moreover, have no assets to fall back on). This underlying condition of financial distress not uncommonly leads to defaults and bankruptcies. Evidence of this can be seen in the data on families who have been sixty days or more past due on debt payments in the year covered by the survey. 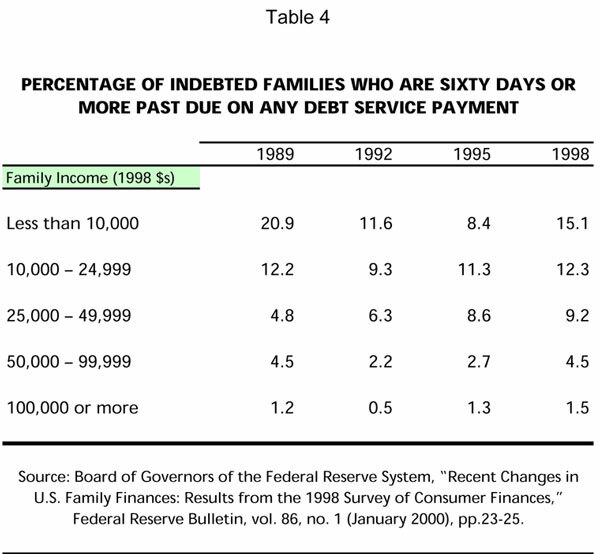 The share of all indebted families who were sixty days or more overdue in a debt payment rose from 7.3 percent in 1989 to 8.1 percent in 1998. The breakdown in terms of income groupings is shown in Table 4. All income levels have seen marked rises in the level of such payment defaults since 1992. When compared with 1989, however, the increase in payment defaults is concentrated entirely among middle-income working-class families (with incomes of twenty-five thousand to 49,999 dollars per year). Not surprisingly, the percentage of indebted families in default is greatest among families with incomes of less than fifty thousand dollars a year and plummets among families with higher incomes. Again, we see that financial distress, associated with indebtedness, is based solidly in the working class. ‘It’s a vulnerability,’ agrees Daniel Bernstein, research director at Westport, Conn.-based investment manager Bridgewater Associates. He says that further increases in interest rates, which he expects over the next six months, run the risk of triggering personal bankruptcies, leading to forced sales of equities and real estate—and possibly ending the bull markets that he believes have been fueling consumer spending. These conditions have been encouraged by changes in the tax system. The Tax Reform Law of 1986 disallowed deductions on tax returns for interest on installment credit. This spurred consumers to obtain second mortgages or refinance old mortgages since interest on the latter was deductible. The enlargement of mortgages (first or second) adds a potentially serious threat. If you don’t pay your installment on your furniture or car, they are repossessed. But if you default on mortgage payments, you can lose your home. What happens, then, when the economy takes a downturn and people lose their jobs? Another area of increased borrowing is installment borrowing, which accounted for 12.8 percent of family debt in 1998. Installment borrowing, as the term is used in the SCF, includes consumer loans that typically have fixed payments and a fixed term. Examples are automobile loans, student loans, loans for furniture, appliances, and other durable consumer goods. The median amount owed on installment loans rose by 36 percent between 1995 and 1998. All of this has served to blur the distinction between home mortgages and other forms of consumer finance. Home mortgages have now—through the expansion of equity loans and lines of credit, along with predatory lending—become inextricably intertwined with the crisis affecting consumer credit in general. Mortgage delinquencies are almost certain to rise in the near-term due to three factors: rising interest rates on adjustable-rate mortgages; the rapid growth of high-risk mortgage lending with downpayments of 10 percent or less; and an expansion of predatory or subprime lending within the home-secured lending market. According to Business Week (November 1, 1999), owner’s equity as a percentage of residential real estate has dropped ten points since 1989, from 66 percent to 56 percent. The massive accumulation of consumer debt, especially among working families, means that eventually, as Micawber declared in David Copperfield, something has to turn up—if bankruptcy is not to occur. A growing debt burden means increasing financial insecurity for most households. Real wage increases of a substantial nature are needed now, not so much to improve the standard of living of workers, but simply so that they can finance accumulated household debt that has risen perilously during the decades of stagnation and debt-financed recovery. Between 1995 and 1998, as the economic expansion of the U.S. economy matured, the median net worth of households in the two lowest income quintiles (less than ten thousand dollars and between ten thousand and 24,999 dollars) declined by 25 percent in the case of the lowest quintile and 20 percent in the case of the second lowest. This means a massive redistribution of net worth in a society in which, as Edward Wolff showed in his important work Top Heavy (1996), the top 1 percent of the population in 1992 already owned 37 percent of the total wealth of the society (46 percent of the financial wealth), while the bottom 80 percent of the population owned 16 percent of the wealth (8 percent of the financial wealth). The dire straits in which many heavily indebted, low- and middle-income families are caught is evident in a dramatic rise in personal bankruptcies, which have shot up from 330,000 in 1980 to 1.4 million in 1999. Together with the sharp increase in payment defaults among those with incomes from twenty-five thousand to 49,999 dollars, this has resulted in a dramatic push for bankruptcy reform in Congress at the instigation of financial firms (particularly credit-card companies) whose object, in the words of the Washington Post (February 18, 2000), is that of clamping down on [bankruptcy] shelters that matter to poor debtors. If these reforms become law, the option of filing for Chapter 7, which cancels debts (as opposed to Chapter 13, which sets up a payment plan), will be greatly reduced. Debtors can file bankruptcy proceedings, but they will be increasingly compelled to pay off their loans! In this election year, the quality of U.S. democracy might be judged by the extent to which this supererogatory piece of extortion of the working class becomes an election issue. At the same time that harsh new disciplinary measures are being considered in Congress for those who file for bankruptcy, we cannot forget that the overall economic reality is that of an expansion heavily dependent on the growth of debt. It is not just consumer debt, of course, that is fueling the current expansion but also corporate (and government) debt. Yet, corporations, due to record cash flow, have been borrowing less (as a share of GDP) in the last few years, while consumers are borrowing more. The problem with all private-sector debt, from the standpoint of the overall economy, is that it can quickly turn what would have been a mild economic downturn, with the coming of recession, into a much sharper crisis—due to cascading defaults. History tells us that sharp reversals in confidence occur abruptly, most often with little advance notice, Federal Reserve Chairman Alan Greenspan warned in October 1999. Or as Marx put it nearly a century and a half ago, due in part to credit/debt expansion and the speculative excesses of money-market swindlers, business is always thoroughly sound, and the campaign in full swing, until the sudden intervention of the collapse (Capital, vol. 3, chapter 30). It would be wrong to assume that the buildup of consumer debt will necessarily spark such a crisis. But it is certain that this vast, unprecedented accumulation of debt—most of it a necessary result of attempts to compensate for stagnant or declining real wages—will make the coming recession far worse and its effect on working-class families more calamitous when it occurs. *Data and analysis of these trends is drawn from Doug Henwood, Booming, Borrowing, and Consuming: The U.S. Economy in 1999, Monthly Review, vol. 51, no. 3 (July-August 1999), pp. 122, 126. Data extends through the first quarter of 1999.